Mickey Atwal in his lab at CSHL. Ideas borrowed from physics could help scientists improve treatments for breast cancer. 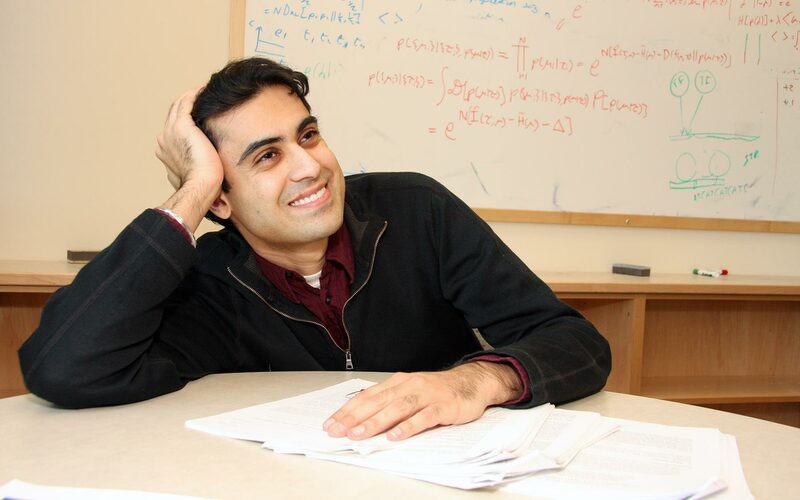 Associate Professor Mickey Atwal explains in this guest blog post. Breast cancer is more than a group of rogue cells. 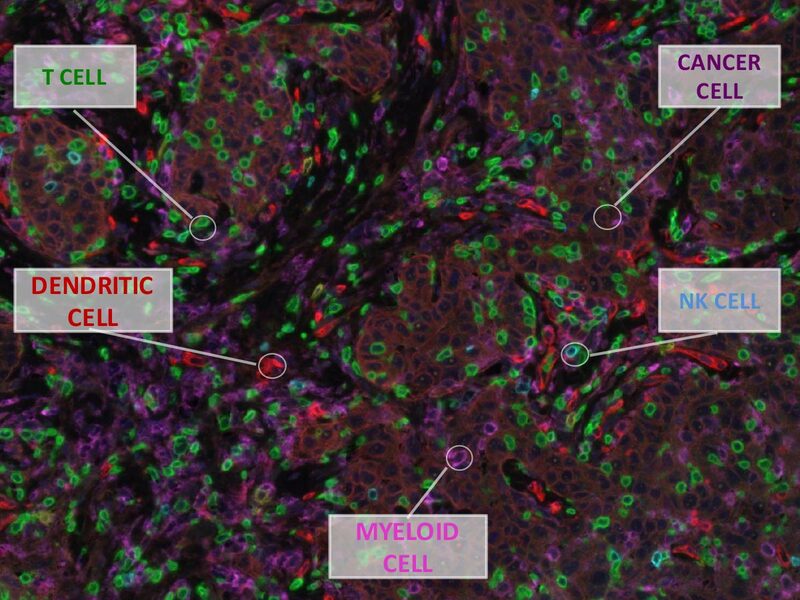 They exist within an intricate battleground inside patients, which scientists call the “microenvironment.” This consists not only of the wayward tumor cells themselves but also a rich mixture of other combatants, such as cells like fibroblasts that maintain physical structure of the surrounding tissue and the myriad types of invading immune cells. I see similarities between the inner workings of a tumor and the way sound waves emerge from gas molecules or swarm behavior arises in schooling fish. As a theoretical physicist, I am fascinated by how large-scale behavior emerges from lots of interactions at a much smaller scale. I see similarities between the inner workings of a tumor and the way sound waves emerge from gas molecules or swarm behavior arises in schooling fish. For a tumor, instead of a sound or a swarm, large-scale behaviors include cancer progression and resistance to chemotherapy. These big problems arise from the collective behavior of the mix of tiny cells—both healthy and cancerous—within the tumor. This kind of analysis suggests a new treatment strategy: to effectively treat breast cancer, you have to target the microenvironment. That’s why my team is interested in understanding how the complex web of interactions in a tumor determine its evolution, and therefore the health of a patient. In this context, the physical properties of a tumor—the location of blood vessels, where immune cells go, how tumors change over time and space—may also be important. In fact, we know relatively little about these things. Working with a multi-institutional team of other physicists, bioengineers and clinicians as part of the Stand Up To Cancer “Breast Cancer Convergence Translational Research Team,” we are beginning to understand the landscape of the breast tumor microenvironment as an ecosystem. This is enabling us to develop precise drug delivery strategies. This research combines more biology-based approaches, such as visualizing the tissues with high-performance microscopes and measuring gene activity, with machine learning, mathematical modeling, and nanotechnology. We believe that understanding physical and genetic attributes of the tumor microenvironment are the key to unlocking the potential of immunotherapy in breast cancer. A striking example of the importance of the tumor microenvironment in treating cancer is immunotherapy, which takes advantage of the body’s own immune system to attack cancer cells. In the past few years, we have seen dramatic breakthroughs in effectively treating lung and other cancers by altering the communication between the immune system and the cancer cells. Late last year, former President Jimmy Carter recovered from melanoma with the help of an immunotherapy drug. Breast cancers are a glaring mystery, however. Immune-based therapies have not fared so well in any of the breast cancer subtypes, despite the fact that we observe a plethora of infiltrating immune T cells in the tumor microenvironment. What are the T cells doing there and why are they unable to do their job and kill off the tumor cells? We need a better map of the battleground within cancer patients’ bodies—a dynamic map that shows how the interacting landscape shifts over time. To draw that map, we must measure gene expression in adjacent single cells while tracking their location in the tumor, a feat that has proven to be a challenge. In my lab we have developed computational algorithms to analyze vast datasets that come from sequencing thousands of individual cells isolated from breast cancer patients, both from primary and metastatic tumors. We believe that understanding physical and genetic attributes of the tumor microenvironment are the key to unlocking the potential of immunotherapy in breast cancer. My lab looks forward to reporting to you from time to time, to give you a front-row seat on the new knowledge that our research generates.